An Advance Health Directive is a way for you to communicate your wishes about medical treatment should you be unable to make decisions about your treatment in the future. It is a very important document and most people don’t think they will ever need it, or complete it before it’s too late. Although it involves unpleasant and uncomfortable discussions, an AHD will benefit you greatly when a critical health issue arises. The document ensures that your loved ones know exactly what you want when they need to make important decisions regarding your health and circumstances. If you haven’t got an AHD, people may make decisions on your behalf without the knowledge of your wishes. In order to make an Advance Health Directive, you must be over the age of eighteen (18) and be able to understand the nature of your decisions. any treatment you want or don’t want should your condition be incurable, terminal, and irreversible, or if you are permanently unconscious. The purpose of the AHD is to give you the confidence that your wishes regarding health care will be carried out. As no one can guarantee the condition of their health, an AHD is preparing you for the unexpected. The best time to make an AHD is now – as you will never know when your circumstances will change. It is a good idea to ensure you have an Advance Health Directive if you are about to be admitted to hospital, or have a medical condition that may affect your ability to make decisions in the future. Our Wills and Estates team will complete a draft of the AHD document for you. Once the draft is complete, you then have to complete the first part of the AHD with your Doctor who must then sign the document, to confirm that you understand all of the medical implications of the directions you have given. Once you have completed the AHD with your Doctor, a Solicitor or Justice of the Peace will then complete another section to finalise your AHD, confirming you have capacity. The completed AHD will then be kept in a safe place which is generally at our office, but you are more than welcome to take the original for safe keeping yourself. It is also recommended that you give a copy of the Advance Health Directive to your Attorney for any personal and health matters, a family member or close friend, your doctor and to your legal representative. 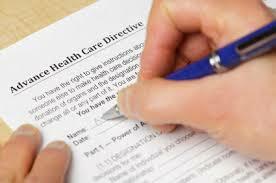 The wishes you have outlined in your Advance Health Directive are not final. You are allowed to change them at any time you would like as long as you remain mentally capable of doing so. We recommend that you review your Advance Health Directive every 1 to 2 years or if there is a major change in your circumstances regarding your health. Contact our team today to discuss any AHD legal concerns or questions you may have.